The SOWERS' programme focuses on outdoor evangelism, and is particularly suited for situations where people gather in a market or for similar activities. It is an extremely effective way to reach people with the Good News. The SOWERS' method is to work with local congregations, by invitation, to train locals in the SOWERS' programme. The local congregation is then able to effectively evangelise their own community and those that convert are discipled by the same congregation that reached out to them. The programme is designed so that it does not require long term external assistance. 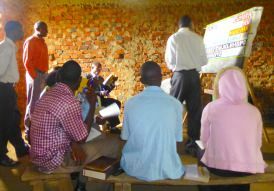 Once trained, local congregations may use the programme to train members in their newly planted churches. The programme is sustainable by the local church and duplicable through its trainers. SOWERS' is one of Bright Hope World's longest running partnerships. It impacts many countries and its reach is quite difficult to capture in a brief overview. It operates in many countries inside and outside Africa. 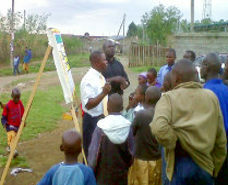 The Bright Hope World partnership involves us partnering with many of SOWERS' grass roots trainers within Africa. The major bases of operation in Africa are Ghana, Cote d'Ivoire, Malawi, Zimbabwe, Zambia and South Africa with ministry into neighbouring countries such as Liberia, Mozambique and DRC. For a number of years SOWERS was the largest beneficiary of Bright Hope World support. Currently the funding continues at a lower amount as some of the key people have commenced income generation activities. The beneficiaries of this partnership are indigenous people whom SOWERS identify as key in the development of training for church leaders. It is estimated that at any given time there are hundreds of people benefiting from SOWERS' work. 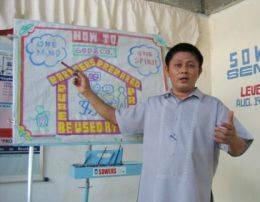 As for indirect benefits, it is almost impossible to tell how far this reaches as there are hundreds of seminars run each year and thousands of people come to faith because of the training. Churches are activated to reach out and many new congregations are established each year as a result of this ministry. 1) the quality of the people leading it. We have known them for many years and know their track record. In 1977 Kwesi Siaw participated in the first SOWERS seminar held in Africa. 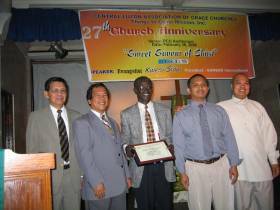 In 1984 he became the National Director of SOWERS Ghana. Kwesi is married to Evelyn and they have three children. "Apart from my work as the National Director, I also take charge of the Brong Ahafo region where there are many SOWERS teams." In 2002, Kwesi was appointed the Regional Director for Anglophone West African Countries. In all there are six countries, namely Gambia, Sierra Leone, Liberia, Ghana, Nigeria and the English speaking side of Cameroon. In 2006 he was appointed as the International Director. Each country develops its own strategy for ministry each year. This is submitted to the International Board who ratifies it as appropriate. Bright Hope World deals with the International Board to determine what will be funded and what the priorities are. For Bright Hope World it is important to try and assist the local people to develop their own sources of income rather than just rely on external funding. This has already commenced with SOWERS International. The annual budget here is US$22,000 and this is sent quarterly and distributed to the people from the SOWERS International Office in New Zealand. 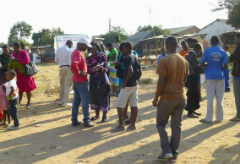 Pastor P in Mozambique wrote that: “I sent a team to one of the rural areas named Nhamatanda to do an open air and I followed them two days later. When I arrived there I found that they had evangelised a chief of this village who is very happy and asked them to conduct an open air meeting at his home so that the surrounding homes would know Christ. We went there and nine individuals got saved. We stayed for a further seven days evangelising new areas and discipling these new converts. What tremendous impact the SOWERS' Programme has! There were 15 of us attending the Level 1 Seminar, including my wife, and it was the first time in my life that I had seen a sketch board. The message “How to be used by God” was presented and it really left a mark in my life, it was like it was written on my heart. My heart was taken by the way the message was presented and that I could remember it back home. I said that this is what I need. Every Pastor wants to preach in such a way that his audience hears him clearly and remembers what he has said. The answer came through the sketch board and I said if I can learn to do what this man is doing, then I am home and dry. Saturday morning the Seminar continued and we had the lesson section. We learnt how to lead a person to Christ, how to counsel after an Open Air Meeting as well as how to look after those people after counselling them. After the lectures we went to the Shopping Centre where we had our first Open Air Meeting. It was good and I began to see the need to have a trained team to help in Open Air Meetings. Later we had our Level 3 training. It was an added dimension to me and I started seeing ‘fruits’ staying. I started training people and I began to see good results, people talked about the follow-ups they were doing and people joining churches. A number of people are now attending churches as a result of the Open Air Meetings. From the SOWERS Seminars, my heart has been drawn each time to those who are outside the church who cannot be reached by mass crusades but through interesting ways like the sketch board. It is a simple humble way, but very very effective. I tell you I fell in love with the paint and brushes and my board. My preaching has changed. I did not have a single Gospel Message but now I have plenty. Each time I go out I have something new to learn either from the people or something about myself. I see my shortcomings as well as my strengths as I reach out. I am really growing. My heart was really enlarged as I saw some of my Level 1s trained at Level 2. Now I do not only have teams to counsel, but I also need to lead, counsel and multiply. I have started my Level 4 training which was my heart’s desire for a long time. I really thank the Lord deep down in my heart - it is a dream come true in my life. From Level 1, I said that if this Level has managed to change my life in terms of ministry, how much more the other Levels. I feel a sense of progress. I am excited about where the Lord has taken me and is still taking me further. My heart is sold out to the Lord and the people He so loves that He gave His son for. My prayer is to be a faithful servant. I want to finish the work the Lord has given me. I feel God has called me to encourage others to go out in a more regular and systematic way. The training I am receiving right now will be a benefit to the Body of Christ. Everyone who has seen our Programme used is recommending it. Next year we expect to see an increase in our teams as well as much church growth. There are churches who want to plant churches using the SOWERS Programme. We will work beside them to achieve this great work which the Lord has left us to go, tell and disciple.